The New York City (NYC) Marathon, the world’s largest annual marathon, took place on Nov. 3 under clear skies and sublime temperatures. The marathon has humble beginnings; its first iteration in 1970 only had 55 runners. The number of competitors has soared since then and this year, the marathon saw 52,812 runners cross the finish line, which broke the world record for number of marathon finishers. However, this was only the beginning of the records broken at this year’s race. Kenya’s Mary Keitany won the women’s division with a time of 2:22:48, which earned her the second fastest winning time in women’s race history and the third fastest overall time in women’s race history. In her fourth NYC Marathon win, she finished comfortably ahead of her competition with a three-minute lead on second-place finisher and fellow Kenyan Vivian Cheruiyot who finished in 2:26:02. Cheruiyot is this year’s London Marathon Champion, but she could not keep up with Keitany’s splits, which began at 6:19 per mile for the first four miles, before she picked up her pace and clocked in 5:18 per mile at the 13-mile mark. 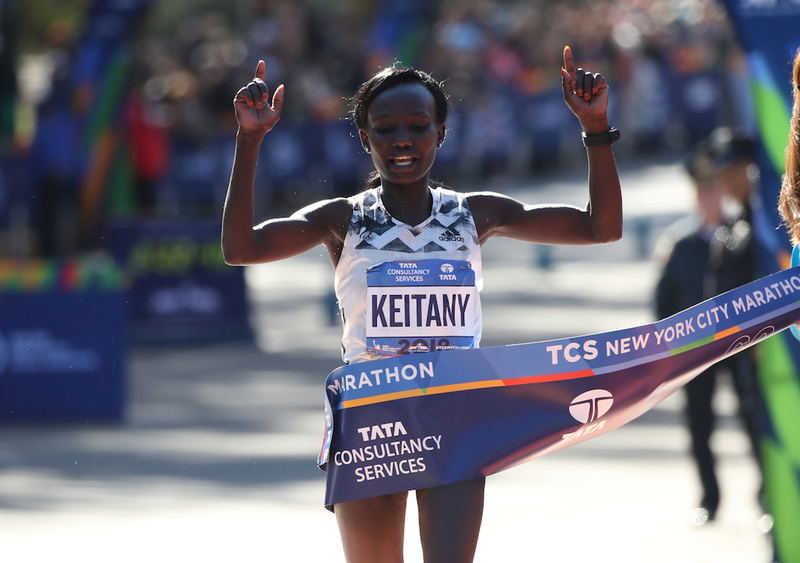 Keitany was able to maintain that pace throughout much of the race and finished with an average of 5:27 per mile. Defending champion American Shalane Flanagan finished third with a time of 2:26:21 which was 30 seconds faster than her winning time last year. In what’s likely her final NYC Marathon before retiring, Flanagan completed her race in a podium finish to add to a career that includes a first-place and second-place NYC Marathon finish. Flanagan was joined in the top 10 by five other Americans: Molly Huddle (4th), Desiree Linden (6th), Allie Kieffer (7th), Mamitu Daska (9th) and Belaynesh Fikadu (10th). Flanagan, Huddle and Linden’s finishes marked the first time since 1978 that three American women finished in the top six. Ethiopia’s Lelisa Desisa finished first in the men’s race with a time of 2:05:59 followed by fellow Ethiopian Shura Kitata (2:06:01) and defending champion Kenya’s Geoffrey Kamworor (2:06:26). Desisa had the lead through most of the course, yet it was a close battle between Desisa and Kitata in the final 600 meters. Desisa’s finish was the second-fastest winning time in the men’s NYC Marathon history, with Kitata earning the third-fastest time and Kamworor the fourth-fastest. Desisa’s historic run had a 5:04 per mile pace through the first three miles and at the 13-mile mark cut it down to 4:39 per mile, finishing with an average of 4:49 pace throughout the marathon. The top American finisher was Jaren Ward, who finished in sixth with a time of 2:12:24. The wheelchair division was won by 20-year-old American Daniel Romanchik with a time of 1:36:21, edging out defending champion Marcel Hug of Switzerland to be the youngest competitor to ever win the New York City Marathon. He also won the Chicago Marathon on October 7th with a time of 1:31:34, again finishing ahead of Hug. The women’s wheelchair race was won by last year’s winner Manuela Schar of Switzerland with a time of 1:50:27. This year’s record-breaking event was helped by beautiful conditions on race day, but it is still a testament to these runners’ training and drive to push the sport forward. Since this marathon is run by some of the best athletes in the world, looking ahead, the 2020 Olympics is shaping up to be an incredible competition.